Hornady Eld Match Ammo - 7mm .284 162gr. - 100/boxextend Your Range And Never Compromise At Any Distance!eld (extremely Low Drag Match)eld Match Bullets Are Technologically Advanced Enhanced Accuracy Target Bullets Featuring Heat Shield Tips With The Perfect Meplat (tip Point) Combined With Numerous Design Features That Deliver The Highest-in-class Ballistic Coefficients Superior Accuracy And Extreme Consistency From Bullet-to-bullet Lot-to-lot.all Manufacturers Conventional Polymer Tips In High Bc Bullets Melt In Flight.hornady® Engineers Discovered That Conventional Bullet Tip Materials In Streamlined High Bc Bullets Melt And Deform. Although Not A Significant Issue Affecting Moderate Bc Conventional Tipped Varmint And Hunting Bullets Aerodynamic Heating Causes Bc Reduction And Degradation Of Accuracy Particularly At Extended Ranges (400 Yds +). 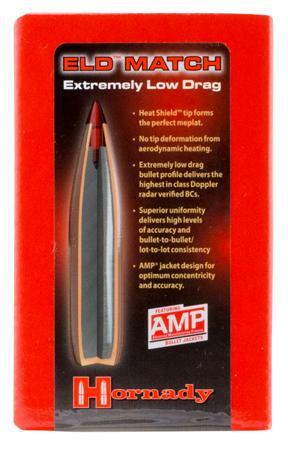 To Counter This Effect Hornady® Identified A Heat Resistant Polymer And Developed The Patent Pending Heat Shield™ Tip. This Revolutionary New Tip Creates The Perfect Meplat (tip) With Exceptionally Consistent Results From Bullet-to-bullet And Lot-to-lot.superior Accuracy And Industry Leading Ballistic Design Has Been Achieved With The Eld Match Bullet. An Optimum Secant Ogive And Boattail Design Along With The Patent-pending Heat Shield Tip Produce A Bullet With The Highest Possible Ballistic Coefficient In Its Class. Verified By Doppler Radar Eld Match Ballistic Coefficients Do Not Vary Due To The Integrity Of The Heat Shield Tip. The Bullets Perform Extraordinarily Consistently With No Bc Degradation At Extended Rangeeld™ Match Extremely Low Drag - Match Best-in-class Bcsthe Heat Shield™ Tip Defies The Effects Of Aerodynamic Heating And Retains Its Shape To Provide A Perfect Meplat (tip) That Is Always The Same Shape.delivers The Highest Degree Of Accuracy And Bullet-to-bullet/lot-to-lot Consistency.streamlined Secant Ogive With Optimum Boattail Design + Highly Concentric Amp® Bullet Jackets + Patent Pending Heat Shield™ Tip Creates A Supremely Accurate High Bc Match Bullet.accurate Radar Verified Bcseld-match™ Bullet Bcs Are Measured With Doppler Radar And Corrected To Standard Atmospheric Conditions. Available As Component Bullets Or In Factory Loaded Hornady® Match™ Ammunition.